A dead dog was found tied to a shovel buried on Mother's Beach in Marina del Rey on March 16, 2016. 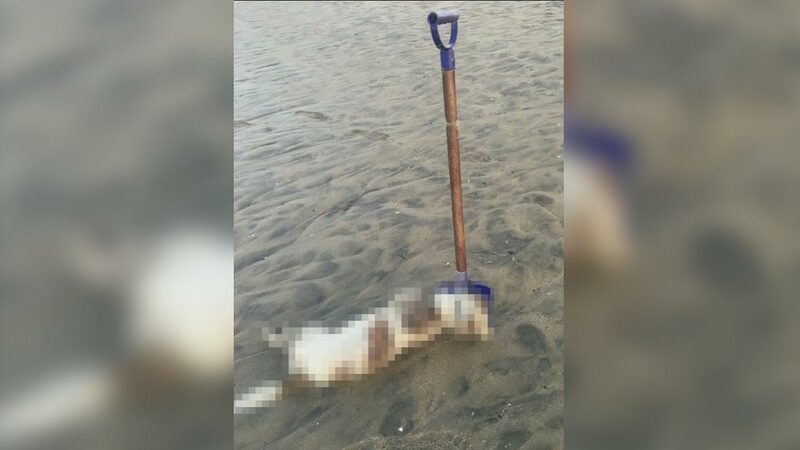 MARINA DEL REY, CA -- A dog believed to have drowned by rising tide after being tied to a buried shovel on a Marina del Rey beach was actually hit by a car and already dead when brought to the beach, officials said. The dog's owner, a homeless man, walked into the Marina del Rey sheriff's station Thursday night and told deputies his dead dog was missing. He said his dog had died after being struck by a car and he had brought its body to the water to keep it cool before taking it to a taxidermist, officials said. The man told deputies that he then went to retrieve some personal belongings at another location and also took a bus to attend church. When he came back, his dead dog and a suitcase he left nearby were gone. A group of canoers making their way along Mother's Beach came across the dog's body last week. They thought the animal was purposely tied to the shovel alive and had died of drowning when the water rose overnight. The discovery spawned rewards from various animal rights groups totaling $28,000 for information leading to the arrest and conviction of the supposed dog killer. Sheriff's officials told Eyewitness News that they believed the dog owner's story. However, some animal rights activists want the case kept open until a necropsy can determine the cause of death. This is not the only recent case of confusion over apparent animal cruelty. The Department of Animal Care and Control received reports this week of a decapitated dog floating near Ballona Creek. Animal control authorities later said that the decapitated dog turned out to be a dead and bloated raccoon with its head still attached.